After a week of posting landscapes - today I thought I'd share a more personal picture, taken on a family outing. 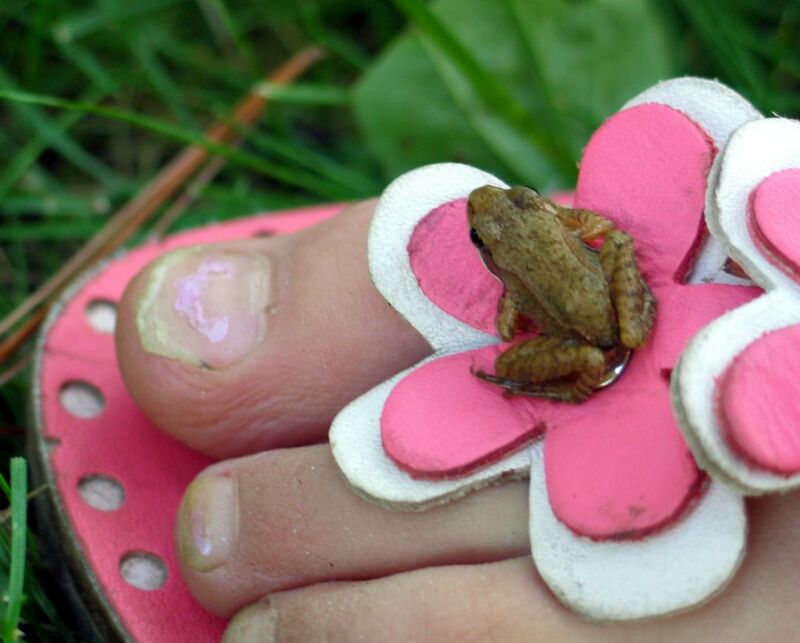 I think this is a spring peeper but I didn't hear it peep - it's not the season. Just to give you an idea of how very tiny it is: the toenail that it's about the size of, belongs to a four-year-old. Here are some more photos from our Sunday at the beach. Wow that is small! But very cute! Even French people have to wait before eat her...i'm joking! It looks like you had a lot of fun on Sunday. Nice arrangement with the frog on the flower. i love wild life,but i dont think i'll be as cool as the girl allowing u time to photograph .eek! Btw, good macro! What a wonderful summertime photo. It captures the spirit of children's encounters with the living world around them so well. Who doesn't vividly remember hours in the garden with butterflys, rolly pollys, salamanders, ants, ladybugs, tadpols, frogs, lizards, and the like. Brings it all right back! This evokes from a response in Portuguese...I'm gonna teach you all a word, frquently used here, but not often by me. Hahahaha!! Great shot, and the "background" you used is a hoot. Frogs usually get lost in the colors around them (camouflage). The pink really brings him (or her... or whatever, cant some frogs be androgynous?) out! So cute and nice catch! You must be really fast with your camera! Felician, not so fast - the frog was quite cooperative! (I think he was traumatized by being handled by the kids!) I got about ten blurry shots and finally one good one!